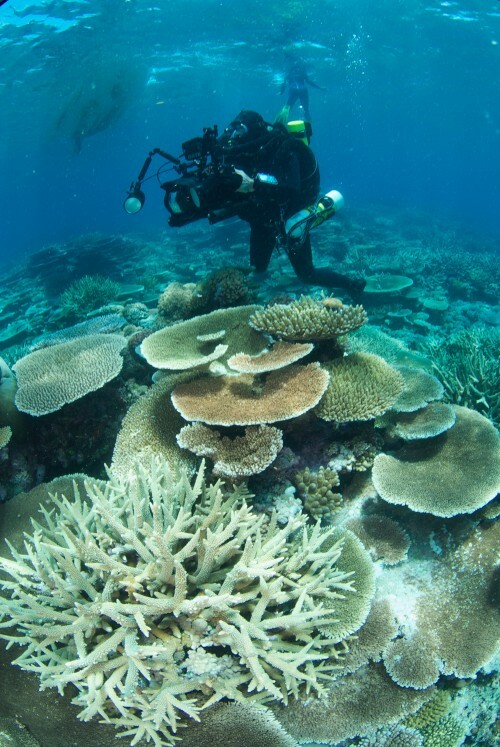 Ross shot underwater scenes off Heron Island for producer Ralf Blasius and Off the Fence production company to tell the extraordinary story of how stoney coral reefs actively change the atmosphere above them to create a shield from the sun’s radiation. Stoney Acropora dominated coral reefs are a substantial source of atmospheric dimethylsulphide (DMSa), one of the most abundant reduced sulphur gases present in the marine boundary layer. DMS is believed to act as a climate regulator of solar radiation and sea surface temperatures through the formation of non-sea-salt sulphate aerosols and cloud condensation nuclei, although this regulation has not yet been demonstrated. Studies indicate that atmospheric dimethylsulphide (DMSa) generated by corals is oxidised to non-sea-salt sulphate aerosols which go on to form cloud condensation nuclei, increasing the albedo of stratocumulus clouds and locally lowering solar radiation and sea surface temperatures in the ocean.